This is my first Visual Series book and I must say I am impressed. This book is far better than I thought it would be. Since I love quilting, I ordered the Visually Quilting. 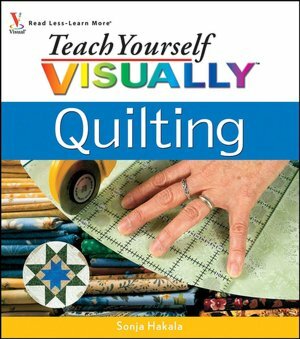 This book makes the learning easy, it covers ALL topics related to quilting, no stone is left unturned. There are so many colorful photos to show you step by step, plus typed instructions. There are chapters on fabric prints, cutting and measuring tools, thread, and sewing machine needles. You are shown exactly what you need to get started quilting. This great book has several quilt patterns all with measurements, yardage to buy and how to make each one. The Fence Rail Pattern shows the quilt in several different colors. It shows you how to pin your rows of blocks together so that the seams between blocks are accurately aligned with one another. Chapter ten shows you many different variations of the Log Cabin pattern. it shows you how to press your blocks the right way. Visually Quilting will show you what you can do with two pieces of fabric and a layer of batting. The choices of fabrics and patterns are endless, once you start, and finish one quilt, there will be no looking back----you will become addicted to making quilts like I am. You will love this book to help you create your own unique style, it will be enjoyable and fun. As a quilter for years I highly recommend it. Wiley Books would love to give away one of these books to one lucky reader from Canada. A random draw will be made by Random.org on December 31, 2011 from all entries received. Leave a comment and your email. This sounds like a great book! Thanks for the chance to win. I've always wanted to make quilts. I tried once but didn't get very far. This book might be the help I need. would love to win this as I've just started quilting.